Rounder Records has announced that Steve Martin and Edie Brickell are releasing their latest album, So Familiar on October 30th. A preview track of "Won't Go Back" can be heard below. Preorder your copy of the record today at a chance to win one of several great prizes directly from Steve and Edie! Hollywood, CA -- Lonesome River Band members Sammy Shelor and Mike Hartgrove performed last night with actor Martin Short when Steve Martin was honored with the 43rd American Film Institute’s Life Achievement Award - the highest honor for a career in film. The award was presented to Steve Martin during the gala tribute at the Dolby Theatre in Los Angeles, Calif. and will air June 13th on TBS at 10:00 p.m. The star-studded event included: Tiny Fey, Amy Poehler, Maya Rudolph, Conan O’Brien, Dan Aykroyd, Jack Black, Steve Carell, and many more. The American Banjo Museum in Oklahoma City is pleased to announce the 2015 inductees into the American Banjo Museum Hall of Fame. This year’s inductees include Steve Martin, the late Pete Seeger, Eddy Davis, Tim Allan and Albert Grover. The National Four-String Banjo Hall of Fame was established in 1998 to honor jazz age four-string banjo pioneers as well as the contemporary artists, educators, manufacturers and promoters who carried on the traditions of their predecessors. The American Banjo Museum was, in its infancy, an extension of that Hall of Fame. In the years preceding 2014, the Hall of Fame honored 71 individuals and entities in the four-string banjo world whose career accomplishments might have otherwise gone unrecognized. As the museum grew and evolved to embrace all types of banjos and playing styles, it became clear that the Hall of Fame should evolve as well. Los Angeles, CA -- Steve Martin and The Steep Canyon Rangers featuring Edie Brickell announced upcoming spring and summer tour dates today. The Grammy Award-winning collaborators will bring their celebrated live show to major cities across the nation. The tour kicks off on March 14 at the Santa Cruz Civic Auditorium and rounds out with three nights at the historic Hollywood Bowl in Los Angeles, CA on July 2 – July 4. Los Angeles, CA -- TeamCoco.com debuted Steve Martin's comedic PBS pledge video which humorously reminds viewers to donate to PBS programming. Martin's first-ever live concert television broadcast titled Steve Martin and the Steep Canyon Rangers Featuring Edie Brickell Live will premiere on PBS' Great Performances on March 4th, 2014 on WNET (check local listings). Watch the PBS pledge video, below. Pasadena, CA -- "Steve Martin and the Steep Canyon Rangers featuring Edie Brickell in Concert" Coming to THIRTEEN's Great Performances in March on PBS. Songs from Martin's "The Crow" and "Rare Bird Alert" as well as his Grammy-nominated collaboration with Edie Brickell "Love Has Come For You" Filmed at the Historic Fox Theater in Riverside, CA. Great Performances turns the spotlight on Steve Martin and The Steep Canyon Rangers, featuring Edie Brickell, with their first-ever live concert performance to be broadcast on television. The evening captures their extraordinary performance at the historic Fox Performing Arts Center in Riverside California last fall. This past weekend, the Steep Canyon Rangers presided over their 8th annual Mountain Song festival in Brevard, North Carolina. The festival, which the group founded in 2006, is an annual fundraiser that benefits the Boys & Girls Club of Transylvania County, NC. This year’s event, which took place over September 13th and 14th, boasted a lineup that included some of the finest musicians on the contemporary bluegrass and acoustic music scene, including Balsam Range, the Carolina Chocolate Drops, Shawn Camp, Bela Fleck & Abigail Washburn, The O’Brien Three featuring Tim & Mollie O’Brien with Rich Moore, Shannon Whitworth, and the Steep Canyon Rangers. North Wilkesboro, NC -- The Kruger Brothers have announced the 2013 Steve Martin Prize for Excellence in Banjo has been awarded to their own banjo player extraordinaire Jens Kruger. Kruger was named as the fourth recipient of the Steve Martin Prize for Excellence in Banjo and Bluegrass Music yesterday. Kruger is known for his innovative banjo composition and performance that integrates folk music with European classical music. Kruger is the first North Carolina resident and first winner born outside the of the United States. Wrapping up a busy summer touring the country with Steve Martin and Edie Brickell, the Steep Canyon Rangers are getting ready to release a new album on Rounder Records September 10th, and host the Mountain Song Festival in Brevard. The new album, Tell The Ones I Love finds the Steep Canyon Rangers in a unique situation, and one they don’t take lightly: “It took a lot of work for us to nose our way into the bluegrass world and become a de facto representative,” Sharp acknowledges, “and we think it’s a real responsibility.” With this new record, “we can be a bridge between the bluegrass crowd and a wider audience that may not be die-hard bluegrass fans.” Yet. On September 10, 2013, Rounder will release the Steep Canyon Rangers’ Tell The Ones I Love, the follow-up to 2012’s Grammy-winning Nobody Knows You. This album was somewhat of a departure for the band: when the time came to record, they headed north to Levon Helm’s famed studio in Woodstock, NY, with Grammy-winning producer Larry Campbell. Performing selections from their new album Love Has Come for You, releasing on April 23, 2013, these new musical partners combine Martin's expressive five-string banjo work with Brickell's heart-tugging vocals and detail-rich lyrics. Joining this dynamic duo are the esteemed bluegrass combo, the Steep Canyon Rangers, with whom Martin has recorded and toured extensively. Steve Martin had joined up with Edie Brickell for their duo debut project Love Has Come For You on Rounder Records. The remarkable new collaboration offers 13 eloquently rootsy compositions that combine Martin’s inventive five-string banjo work with Brickell’s distinctive vocals and vivid, detail-rich lyrics. Love Has Come For You is a substantial departure, as a well as a creative milestone, for both artists. The album is available for pre-ordering in a variety of media format combinations (see below) with some special offers tossed in too. 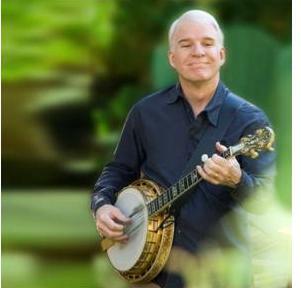 Performing selections from their new album Love Has Come for You, releasing on April 23, 2013, the new musical partners Steve Martin and Edie Brickell combine Martin's expressive five-string banjo work with Brickell's heart-tugging vocals and detail-rich lyrics. Joining this dynamic duo for this performance will be the esteemed bluegrass combo, the Steep Canyon Rangers, with whom Martin has recorded and toured extensively. May 30th, Greenville, South Carolina's The Peace Center will feature Steve Martin, Edie Brickell and the Steep Canyon Rangers. Rounder Records will release Steve Martin and Edie Brickell’s inaugural duo effort Love Has Come For You on April 23. The remarkable new collaboration offers 13 eloquently rootsy compositions that combine Martin’s inventive five-string banjo work with Brickell’s distinctive vocals and vivid, detail-rich lyrics. Love Has Come For You is a substantial departure, as a well as a creative milestone, for both artists.